Hunter Knepshield's modular restroom facilities include solutions for virtually any situation with fast turnaround and simple site preparation. Pre-manufactured for economy and ease of installation, the buildings are pre-plumbed, pre-wired and shipped ready for placement. Interiors are designed for low maintenance, including wall-to-wall, floor-to-ceiling reinforced fiberglass for easy washdown. A variety of plumbing choices, including composting toilets, chemical toilets and flush toilets, are available to match on-site resources. The standalone restroom structure pictured here is located in a public area. Varco Pruden supplies the steel roof and structural framing. The builder or general contractor then finishes out the plumbing, interiors, exterior brick and glass. Restroom Facilities Ltd. Is a leader in the design/build/installation of high-quality, vandal-resistant, custom restroom/concession/storage buildings. 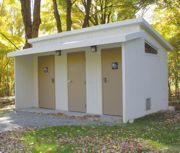 From an urban park prone to vandalism to matching a historic landmark, if you need a restroom building with or without showers, a concession stand with storage or a pump house enclosure, Restroom Facilities can do it all. The company constructs your building offsite, ships it and installs it in just three to five days with an experienced crew. The process is completed on time, on budget, with minimum site disruption. Deltec Homes has been buildings its trademark round structures since 1968. The company's panelized precision-engineered building system creates an attractive structure that is unique, durable, energy-efficient, high-wind-resistant and flexible in design. Depending on the size, Deltec's circular structures can often be erected in just a few days, saving you time and money. Understanding your needs combined with professionalism, excellence in planning, design and performance all result in a quality commercial building to meet your needs. Murdock-Super Secur Pathway Series multi-person outdoor restrooms can range in size from three to 12 fixtures per restroom. Easily field-assembled, Murdock-Super Secur buildings can accommodate custom requests, including storage and shower rooms as well as special exterior finishes to suit any setting. All of these steel buildings come complete with bid-ready plans, which can be certified upon request. Buildings can be fully ADA-compliant and are ready for electrical/plumbing connections. Easi-Set, a leader in transportable, precast all-concrete buildings, provides enhanced weather-tightness and impact resistance through the patented post-tensioned roof and floor design features. Easi-Set Precast Restrooms: meet IBC, ADA, Forest Service specifications and local building codes; have 3-inch-thick walls and 4-inch-thick roof and floor; require no foundation; are maintenance-free (won't rust, warp, corrode, rot or burn); offer green-friendly features (waterless, solar and electricity-free choices); are manufactured locally; and can be custom-designed to meet your unique needs. Biological Mediation Systems manufactures sustainable, custom-designed, environmentally friendly, energy-efficient structures and restroom facilities. BMS will work with you to create facilities meeting your needs. Architectural features and materials of existing structures can be matched. The WRS waterless system is efficient, reducing both waste and maintenance. Flush facilities, concession buildings and park entry stations can also be custom designed. Romtec offers a wide range of turnkey buildings for parks and recreation facilities. Romtec makes public restrooms, restroom-shower buildings, concession and multipurpose park structures, ticket booths, kiosks, shelters, pavilions and equipment buildings. Romtec designs, manufactures and installs complete pre-engineered buildings that meet all codes. Structural features include permanent concrete foundation, seismic and hurricane engineering, reinforced concrete walls, structural insulated panel roof, powder coated steel doors, windows and vents. Vandal-resistant exterior finishes, and energy- and water-saving fixtures are available.